I’ve written before about the creepy interrogation manual the CIA issued in 1983 on “Human Resource Exploitation.” The precursor to this manual is the infamous Kubark report, written in 1963. 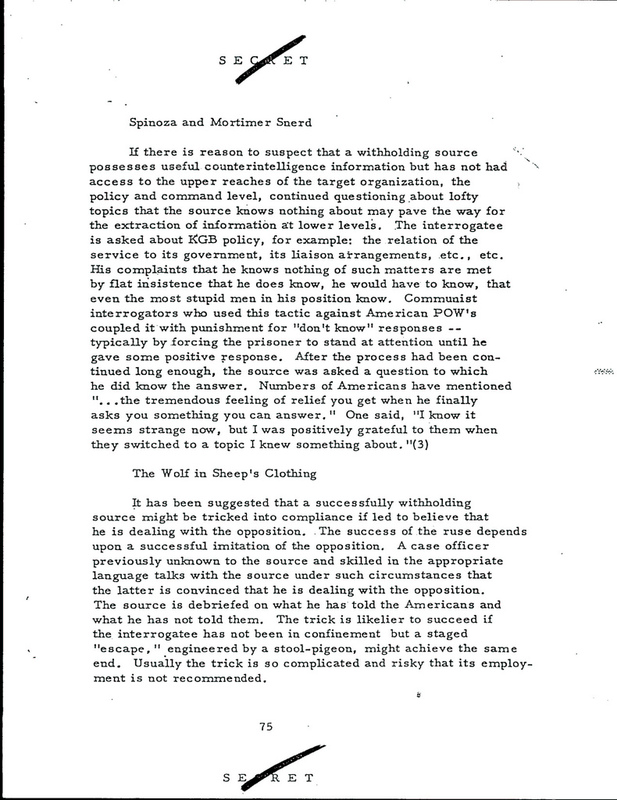 This CIA document outlines various coercive and non-coercive methods of gathering “counterintelligence information” from uncooperative sources. Over forty years later, some of the coercive techniques remain uncomfortably familiar: electric shock, self-inflicted pain, and sensory deprivation in a cell (or even better, confinement in a “water-tank or iron lung”). But even more disturbing than the interrogation techniques Kubark teaches is the report’s tone. Kubark is written with a sense of humor. Now where do I see the humor? Look at heading of this section: “Spinoza and Mortimer Snerd”—two examples of lofty topics that the victim presumably knows nothing about. It’s supposed to be a joke, but there is a serious disconnect between the material and the gratuitously obscure allusions in the heading. Especially when you consider who Mortimer Snerd is. I’ll admit—I didn’t know myself. My first thought was just as incongruous as the CIA’s little joke: Wow, now that’s a great name for a rock band. A quick search revealed two things: first, that Mortimer Snerd was, alongside the more famous Charlie McCarthy, one of the characters of the great puppeteer and ventriloquist Edgar Bergren; and two, that in the seventies Mortimer Snerd was the name of a small-time rock band—supposedly the first Kiss tribute band, in fact. Now that’s trivia worth being tortured for. But should the CIA ever come knocking at my door, at least I now know the answer. Now I just have to figure out who this Spinoza fellow is. Jane Mayer, an uncompromising journalist who’s become a thorn in the side of the Bush administration (for her reporting on current U.S. torture tactics and the method of “extraordinary rendition”), has written a New Yorker profile of Joel Surnow, one of the creators of the hit television show 24. Her profile focuses on Surnow’s support of torture and his show’s over-reliance on what security experts call the “ticking time bomb scenario”—a hypothetical situation used in 24 to justify torture, but which has never occurred in real life. In her article, Mayer reveals that “several copies of the C.I.A.’s 1963 KUBARK interrogation manual can be found at the ’24’ offices.” I find this simply amazing. The KUBARK manual, which I mentioned in an earlier post on the CIA , is infamous for its straightforward tips on how to conduct coercive interrogations. Even more amazing, the lead writer for 24 admits that most of the torture scenes in 24 are not inspired by the CIA. Gordon tells Mayer, “for the most part, our imaginations are the source. Sometimes these ideas are inspired by a scene’s location or come from props—what’s on the set.” Gordon goes on to say that he (and reportedly Kiefer Sutherland, who plays Jack Bauer) are running into torture “fatigue.” They’re getting tired of it. Maybe they should, as U.S. Army Brigadier General Patrick Finnegan (who also happens to be the dean at West Point) suggests, “do a show where torture backfires.” Because in real life, that’s what happens. Not only is torture illegal and unethical. It simply doesn’t work. My current research project revolves around the use of torture in the so-called “War on Terror”—and I’m uncovering a wealth of astonishing, depressing material, much of it compliments of the U.S. government. 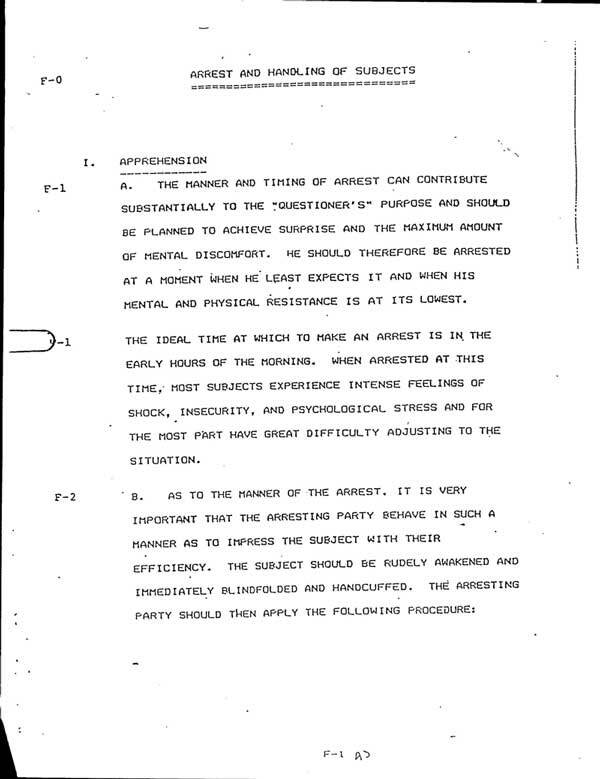 The manner and timing of arrest should be planned to achieve surprise and the maximum amount of mental discomfort. He should therefore be arrested at a moment when he least suspects it and when his mental and physical resistance is at its lowest. Ideally in the early hours of the morning. When arrested at this time, most subjects experience intense feelings of shock, insecurity, and psychological stress and for the most part have great difficulty adjusting to the situation. It is also important that the arresting party behave in such a manner as to impress the subject with their efficiency. My hats off to the CIA for their insights and inspiration to all those aspiring fascists out there. Way to export democracy, guys.